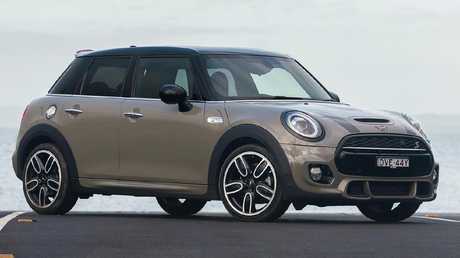 2018 Mini Cooper five-door hatch. When BMW relaunched the Mini brand in 2000, I thought it might last 10 years. Design, a key element in any car, is everything to the Mini. BMW did a brilliant job nailing that classic Mini shape and proportion - and evoking the original's cool Britannia 1960s vibe - but designer-driven cars, especially retro revisits, usually have limited appeal and flame out pretty early in the sales charts. Not so the Mini, powering along in its third 21st century iteration even if most of its customers and many of their parents were not born when Alec Issigonis penned the original in 1959. It has been helped by the addition of five-door variants, including the Countryman SUV in 2011, giving it a measure - let's be generous and say 15 per cent - of extra space and practicality compared with the three-door. Nobody buys a Mini for sensible reasons. It's usually love. To paraphrase another legendary act from the 1960s, is love all you need? 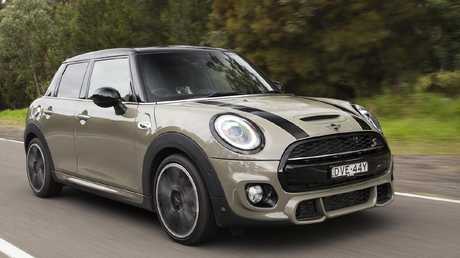 Style master: Mini Cooper is one of the better looking small cars on the market. 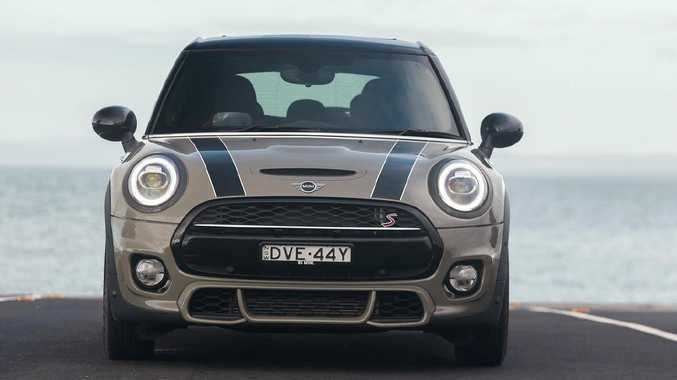 Our test car, a base Cooper five-door 1.5-litre turbo triple, costs $31,150 with a six-speed manual or $33,650 as tested with a seven-speed dual-clutch transmission. In a small car, 30-large and a bit usually gets you the works but the Cooper's feature list reads more like $13,990 worth. Standard are 16-inch alloys, cloth-upholstered front seats with manual adjustment, manual aircon and rear parking sensors. Infotainment is BMW's iDrive, with digital radio, navigation, traffic information, voice control and Apple CarPlay. Android Auto connectivity and BMW's email/SMS functionality are missing. The Mini Connected app lets you play besties with your car by phone if you're in boring company. Of course the gear you should get as standard is available at extra cost. Our test car adds a swag of options, including heated sports seats, sunroof, wireless phone charging, dual-zone aircon and LED headlights, plus must-have groovy cosmetic upgrades such as LED tail-lights with Union Jack motif, gloss black alloys, bonnet stripes and black roof, for an all-up spend of $40,900. Blimey. Extras cover: On the Mini Cooper nearly everything that should be standard costs extra. The interior's wow factor is still like no other, if only because it's so unlike everything else, with a complete indifference to ergonomic efficiency and logical placement. Behind the dash, its workings are BMW but, in the translation to Mini, German order and precision somehow have transformed into chaos and confusion. That said, too many car interiors look like the creations of grey, miserable people. 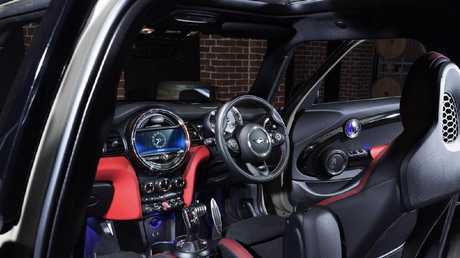 The Mini's cabin is joyfully exuberant and designed to make you feel young and optimistic, even if you're not. In that respect, it works. The driver's seat could use angle adjustment for the flat cushion but is otherwise supportive. Tall drivers aren't cramped for legroom but rear passengers do it tough and boot space is tight. On standard, non-adjustable suspension and relatively tall tyres (195/55), the ride is surprisingly compliant. It's firm, obviously, but only the nastiest bumps jolt the front end. In a word, pathetic. No other car I can think of at this price-point is so completely devoid of driver-assist safety technology. There's no collision alert, no autonomous emergency braking, no adaptive cruise, no blind spot monitoring, no rear cross traffic alert and no lane keep assist. Still, if you have a crash because these safety features aren't in your Mini, you can at least push the emergency call button in the roof to get help. Sasfety warning: The Mini is devoid of driver-assist safet tech. BMW's turbo triple is a natural fit with the seven-speed transmission. Top end performance is flat, even in Sport mode, but its 220Nm of torque kicks in from 1480rpm and persists to 4200rpm, so tractability and responsiveness at low and mid-range revs are outstanding. So is fuel efficiency - on the highway, it returns 5L-5.5L/100km and in town 7L, using premium unleaded. It's not quite as smooth as a four, though, especially at low revs, while the auto stop-start is slow and clunky when it fires the engine. 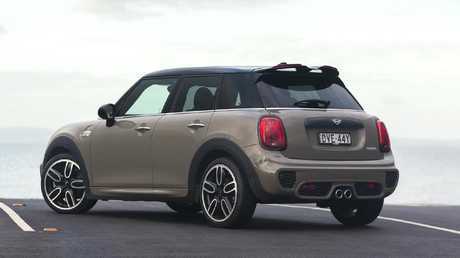 Mini makes much of its "go kart handling" and the Cooper five-door is certainly one of the sportier small hatchbacks. The same model, tested in 2015 with optional adaptive suspension and stickier Continental tyres, walked the Mini walk much more convincingly. This 2018 car, with less adhesive Hankook tyres and standard suspension, pushed its front end harder in corners, exhibited more body roll and lacked the clarity of feedback and steering precision of its predecessor. Minis used to be among the best handling small cars. Not now. Unresponsive: The is not as good to drive as it used to be. Cars are boring. Except this one. It makes me feel happy, so the price is irrelevant. I appreciate beautiful, original design and the Mini will complement all of the other designer label objects in my life. It may also make potential partners think I'm younger and more interesting than I am. If your life will only be complete with a Mini in it, go right ahead. You won't be disappointed. All you need is love and $33,650. But if you look at a Mini and see an overpriced fashion statement, I'm with you there, too. Beautifully clean, elegant interior provides more standard equipment and rear seat space than the Mini. Similarly frugal, tractable performance from 92kW/200Nm 1.4-litre turbo/seven-speed dual-clutch auto. A new model arrives early next year. Special headbanger edition, with 300W Beats audio featuring "reverberating but crystalline sound". Err, whassat, dude? 85kW/200Nm 1.0-litre turbo triple/seven-speed dual-clutch auto. AEB standard.